The Startup of the Year 2013 awards ceremony was held in Moscow's Central House of Entrepreneurs on December 16. The ceremony brought together 300 guests, 50 journalists and government representatives, as well as industry experts, startup teams, and young entrepreneurs. The organizers believe that "Startup of the year" is some kind of "Oscar" for young entrepreneurs, with the famous statuette it makes even a color (the winners are awarded the Golden Apple). Its main purpose is to encourage beautiful and effective business decisions, to improvise a creative approach to building new business, enjoy the success of the brightest startups and inspire young entrepreneurs to new achievements. "During my work in the SBD of small business of Moscow, a large number of State programmes to support entrepreneurs have come into sight. If at first the main stake is on financial incentives for entrepreneurs, now the Moscow City Government focuses on education, a consulting support on providing quality and free services. Give small businesses not fish but a bait and teach them how to use it. The main task is showing the relationship of the State to small business. Come, join programmes for free, make useful contacts and relationships, learn, and grow together-to do this, today there are all conditions, "he added. The awards grow in stature year on year, proving the importance of the event to young entrepreneurs. This year, 18 teams out of the original 229 had reached the finals in seven categories. The ceremony began with each of the finalists presenting their business idea. The awards part of the evening was opened by Igor Agamirzian, CEO of the Russian Venture Company. The first award of the evening was presented in the Best Technology Startup category. It went to RoboCV, the developer of intellectual autopiloting systems for vehicles. Dmitry Smirnov and Sergey Maltsov received the award from Lenovo General Manager Alexander Katayev. Next came the Best Internet Startup category, which celebrates outstanding companies whose entire operation is online based. This year’s partner of the nomination was the Internet Initiatives Development Fund (IIDF). The winner was Miiix, a platform connecting online stores and wholesale suppliers. Dmitry Bereznitsky and Sergey Ryabov received the award from IIDF director for acceleration programs Dmitry Kalayev. In the Discovery of the Year/Quick Start category, the award went to the otsledit-posylku.rf online service as the fastest-growing business. The company provides SMS and e-mail parcel tracking services for parcels ordered from online stores. Its founders, Dmitry Barychev and Alexander Dubinin, received the award from Dmitry Molchanov, head of the Small Businesses of Moscow federal budget institution and a lecturer at the Higher School of Economics. In the Socially Important Startup category, the award was won by the Tomsk Region-based rubbish collection and recycling specialist Tom-PET. Irina Pavlova, deputy head of the department for social and charity projects at the Our Future Foundation, presented the award to Top-PET founders Denis and Yana Korniyenko. In the Global Startup category, which celebrates companies serving clients outside Russia, the award went to the SkyDNS content-filtering and cybersecurity cloud service. The SkyDNS founder received the award from Igor Karpovich, director for strategic business development at Sberbank. The winning team also received a voucher for consultations with Sberbank specialists. The most valuable thing about any startup is a like-minded team. One of this year's nominations celebrated the most intelligent, team-working, and driven team. The award was won by LoyaltyPlant, whose mobile applications help businesses keep in touch with their clients and boost profits with the help of an effective loyalty program. Anna Dyachenko and Yevgeny Tumashov received the award from Tatyana Kartasheva and Oksana Melnikova, representatives of the Pruffi headhunting agency. RoboCV was also named the best Moscow-based startup. Ekaterina Bulycheva, deputy director of the Moscow innovative development center, presented the winner with a voucher for an experience-gaining trip to the U.S.
One more new category this year, introduced by the Russian Venture Company, celebrated the greatest contribution to the development of popular information resources devoted to the Russian venture market. Russian Venture Company Executive Director Alexander Potapov presented the winners with diplomas and commemorative statues. 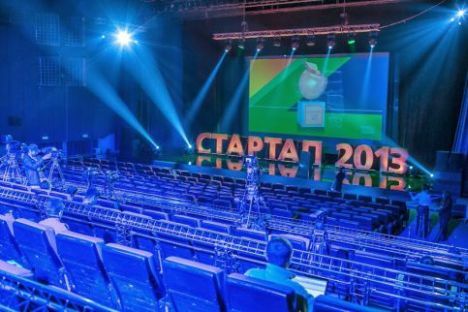 At the end of the ceremony, all the awardees received vouchers worth 10,000 roubles ($312) from the event ticket seller Biletix, the strategic partner of the ceremony. The winners in the Popular Choice and Global Startup categories were presented with air tickets to travel to Abu Dhabi. Global Techinnovation presented all the winners with consultations vouchers. Maxim Bunyakin from the management consultancy Branan presented the winners with gift vouchers. A separate gift voucher was presented to the company Loyaltyplant by Strikitsa Consulting. Snob Magazine presented the winners with one-year premium subscriptions. The company Realtimeboard, which itself won a startup award last year, presented all the winners with one-year team accounts for its system. Set up by the business incubator of the Higher School of Economics, the Startup of the Year awards are currently in their sixth year.